On a Sunday morning in early March, more than 80 of the 108 people featured in Kapulani Landgraf’s installation ‘Au‘a, one of four works on view at the museum as part of the Honolulu Biennial 2019, came to the museum to see the finished artwork. Landgraf selected subjects she felt have contributed to the community and photographed each person, then superimposed the words “we are not american he hawaii au mau au mau” on their larger-than-life portrait. We asked four of them to tell us what they had thought when approached by the artist and what the work means to them. We are publishing their responses over the coming weeks. ‘Au‘a is on view through May 5. I was a little skeptical, there’s a lot of fear that goes along with stepping up and making that comment. Admitting that as being truth was a challenge, but once it happened, it…was responsible. The kuleana that goes along with it is always present in everything that we do. The militarization here, the way the government is and how the Hawaiians have just been pushed aside and denied access to almost everything and becomes normal, even for us. We tend to say, ‘Oh well,’ and to make the step, you know—‘I am not American—to take that stand is really a challenge. And I think a lot of people that didn’t want to do it was because that line of fear that we face, kept them from taking that step. When I first saw it, I realized, when we’re doing our individual work sometimes it feels like you’re the only one, very lonely, and a lot of times, especially when you’re in public, making statements, it’s a challenge. But to see everybody here—we’re not alone and even though we only do a small part, the foundation is getting bigger and stronger and deeper and more stable. All of these faces could be replaced with kupuna who were here before us. And that’s a different tribute, because they laid the foundation and their bravery is what set the path for us. About the subject: With deep roots in Wai‘anae, Sparky Rodrigues has been a key player in the legal fight for the halt of live-fire training in and access to Mākua Valley, which is been occupied by the U.S. military since the 1920s. He is a member of Mālama Mākua, for which he has served as director, president and board member. 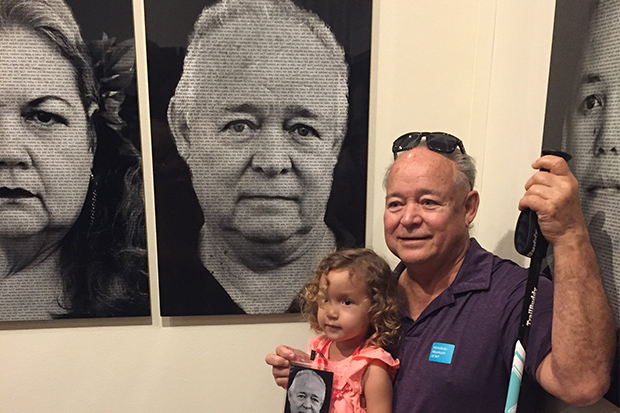 He is pictured above with his granddaughter Alina next to his portrait in ‘Au‘a. What is the translatiion of the word Au`a? My husband was born in the village of Au`a in Samoa, are they connected in any way? I’m Haole but I support your mission 100%. You deserve to have ALL your Aina returned to you, it is a true injustice. Many blessings!